As European asset owners continue to boost exposure to alternative assets, they are drawing on a variety of approaches to solve their challenges. Northern Trust’s latest white paper draws on live survey data to examine these challenges and explore the benefits and various approaches to accessing alternatives. 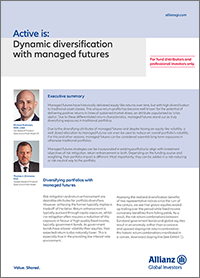 Overcoming the diversification challenge. 10 rules for constructing a robust premia portfolio with stable performance.